"Electric Light Orchestra, Out Of The Blue OBI Box Set - 5 CDs"
ELECTRIC LIGHT ORCHESTRA - OUT OF THE BLUE - Japanese OBI MINI REPLICA LP TITLES making a 5 CD Box Set- Japanese OBI MINI REPLICA BOX SET Japanese re-mastered Mini LP replica Limited Edition Collection Recorded from the finest Original Masters available. Each title Comes with anti-static sleeves similar to Vinyl LPs, Cardboard packaging exact to the original LP, Re-sealable plastic wrap cases for protection of each collectible and include extensive Liner Notes Booklet. Actual miniaturized version of the 12" LP in 4" CD version Special VERY RARE LIMITED EDITION BOX SET ONLY PRODUCED ON FUTURES FOR THIS ONE TIME PRESSING -- were only available in Japan. 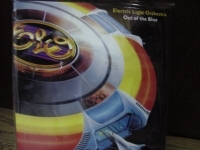 THE ELO SET - OUT OF THE BLUE INCLUDES OUT OF THE BLUE DISCOVERY TIME SECRET MESSAGES BALANCE OF POWER Track Listings 1. Turn To Stone 2. It's Over 3. Sweet Talkin' Woman 4. Across The Border 5. Night In The City 6. Starlight 7. Jungle 8. Believe Me Now 9. Steppin Out 10. Standin' In The Rain 11. Big Wheels 12. Summer And Lighting 13. Mr. Blue Sky 14. Sweet Is The Ngiht 15. Whale 16. Birmingham Blues 17. Wild West Hero 18. Prologue 19. Twilight 20. Yours Truly 2095 21. Ticket To The Moon 22. Way Life's Meant To Be 23. Another Heart Breaks 24. Rain Is Falling 25. From The End Of The World 26. Lights Go Down 27. Here Is The News 28. 21st Century Man 29. Hold On Tight 30. Epilogue 31. Secret Messages 32. Loser Gone Wild 33. Bluebird 34. Take Me On And On 35. Four Little Diamond 36. Stranger 37. Danger Ahead 38. Letter From Spain 39. Train Of Gold 40. Rock 'N' Roll Is King 41. Heaven Only Knows 42. So Serious 43. Getting To The Point 44. Secret Lives 45. Is It Alright 46. Sorrow About To Fall 47. Without Someone 48. Calling America 49. Endless Lies 50. Send It 51. Shine A Little Love 52. Confusion 53. Need Her Love 54. Diary Of Horace Wimp 55. Last Train To London 56. Midnight Blue 57. On Teh Run 58. Wishing 59. Don't Bring Me Down These are Japanese digitally re-mastered Mini LP replica CDs (the OBI Edition).